10/1/2012 Ash Zealot’s ability doesn’t allow any player to cast cards from a graveyard. Such cards need another way to be cast, such as the flashback ability. 10/1/2012 Ash Zealot’s triggered ability will resolve before that spell resolves. 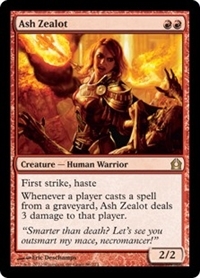 10/1/2012 Ash Zealot’s ability doesn’t trigger if you put a card onto the battlefield from a graveyard (using Grave Betrayal’s ability, for example).